Throw your way to victory and Das Boot all while meeting new people and enjoying bar specials! 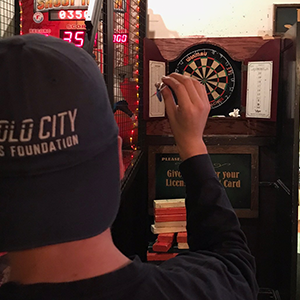 Play in the Baltimore Darts League with Volo City and live it up at the bar each week with awesome people. Designed to be super social, our Baltimore Darts League is the perfect place to meet new people and make new friends. We’re playing in your favorite Baltimore bars all year long – register today! Minimum players for a full darts team is 5. If you do not meet this minimum your team will be merged with free agents. A Captain must create a team and all the team members must “join” the team. The Captain can pay for everyone or you can split up the fee among team members. Signing up as a solo player is the best way to meet people in Baltimore! Teams that forfeit 2x in a season will not be included in the final championship week. The game of Cricket will be played with a double Bull’s Eye. The object will be to close the numbers 20, 19, 18, 17, 16, 15 and Bull’s Eye in any order before your opponent(s). The player/team that closes all numbers and the Bull’s Eye first, and has a greater or equal point score, wins. An outer Bull’s Eye will count 25 points and an inner Bull’s Eye will count 50 points. 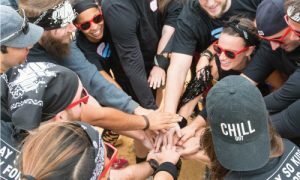 We are known as the most social league in Baltimore and that’s because we care about the bar experience! For assistance and inquiries about scheduling, rules, and officiating, contact us at baltimore@volocity.org! To learn more about Volo City, read About Us or our Frequently Asked Questions.